THE TEERITZ AGENDA: Friday 4/3/2016 - Happy Birthday, Mr Craig!, New Job Begins, Bookshelves Are Up & This Week's Wristwatches. Friday 4/3/2016 - Happy Birthday, Mr Craig!, New Job Begins, Bookshelves Are Up & This Week's Wristwatches. Right, so I've gotten home from work and mixed myself a Gin Rickey. That takes the edge off. 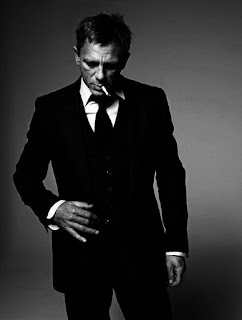 had asked me back in 2005 whether or not I thought he'd make a good James Bond, I would have probably said no, based on the fact that he didn't fit Ian Fleming's physical description of 007. Bond in the books was described as having black hair, with a persistent 'comma' that often fell just below his right eyebrow, a scar across the right cheek of his tanned face, and a cruel mouth. 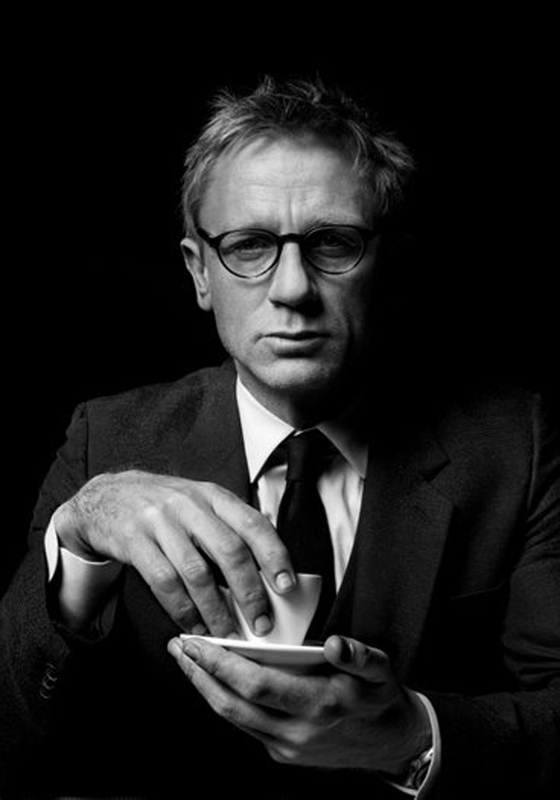 Daniel Craig had blonde hair and somewhat craggy features. The Fleet Street Press were quick to point out these aspects of Craig's appearance and they had a field day with it. And then, about a year later, Casino Royale hit theatres and everybody kept their mouths shut. I had read some interviews with Craig during filming and he'd stated that they were just trying to make a good Bond film. Well, he under-promised and over-delivered. By the time the classic pre-credits parkour/fight-on-the-crane sequence was over, I'd forgotten all about black commas of hair, scars on cheeks and cruel mouths. Daniel Craig WAS Bond, as far as I was concerned. Add to this the fact that he is a truly great actor and I knew then that 007 was in good hands. So far during his tenure as Bond, I don't think he's had the chance to do other work of any great stature, but I think this will change once he hangs up the Walther PPK for good. Which may happen soon, methinks. There's been no word yet on whether he'll do another Bond or not. The internet is rife with rumours and most of them point to his contract yet to be renegotiated for one more round of Vesper Martinis. Much would depend on how soon they get around to starting the next film. Craig had stated in one infamous interview shortly after wrapping up SPECTRE that he'd 'rather slash my wrists' than think about the next Bond movie. I get it. Making a Bond movie takes up the better part of a year. Not only that, but I can;t help but think that he'd like to do some other work before getting behind the wheel of the Aston Martin again. Either way, if SPECTRE was his Bond swan-song, then regardless of what I thought of that film, I just wanted to say "thanks" to Mr Craig for making us forget the days of Die Another Day and for making it cool to be a Bond fan again. Happy Birthday to you, sir! There are some ragged copies of certain titles that I'll probably get rid of. And I'm sure I have another die-cast Aston Martin DB5 model somewhere, so that will surely wind up on the shelf at some point. It's gonna look like a friggin' car-park by the time I'm done. The rest of the shelves are pretty full. I'm thinking I may have to make one more much, much smaller one that will sit in between the desks. That one will hold the reference books to do with writing and probably the printer will sit on top of it. Another option might be to use one of the old library trolleys that we have. That might be the less stressful and time-consuming answer. Okay. Seven pm and I'm feeling a little light-headed. Think I'll have dinner before I finish this post. Right, that took longer than I thought. Friday Night is pizza night. I had to wait for the kids to finish making theirs before I could get near the oven. And, of course, now that I'm back at the computer, I can think of much else to say, really. Work has been good this week as I continue to get the hang of the job. Got the weekend ahead of me and I'll be taking some books to a second-hand bookstore tomorrow sometime. I think a bunch of Lee Child thrillers will have to go. I've been asking myself the old 'would I ever read this book again?' question in an effort to determine what stays and what goes. Thanks for reading and have a great weekend, all! 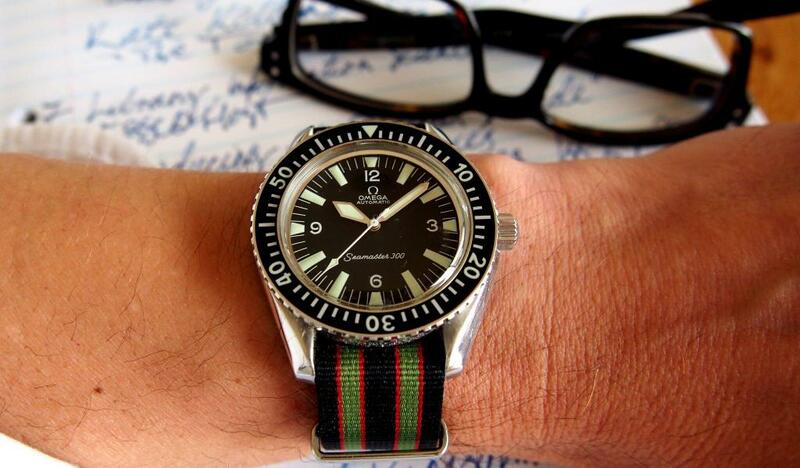 The Omega Seamaster AquaTerra Co-Axial. This watch has been pushed a few rungs down in my collection as I find myself wearing other watches. Such a smart wristwatch, though. I have a feeling it'll get a little more wear in the coming months. Goes nicely with a crisp white shirt and V-neck jumper. Ta, and have a good one, peeps! Congrats on the new job, and good work on those bookshelves. Take care of yourself. Congratulations on the job. Sounds like a great one for you! Thanks, gents! It's early days, but so far, so good. And the bookshelves are still standing, too! Will wonders never cease?